What better time than Easter Sunday to be thinking about chocolate. Lots of chocolate. And having posted about artists working with their own body the last couple of days, today I’m all about an artist who uses her body not as the source of the image but as the tool to make the work. 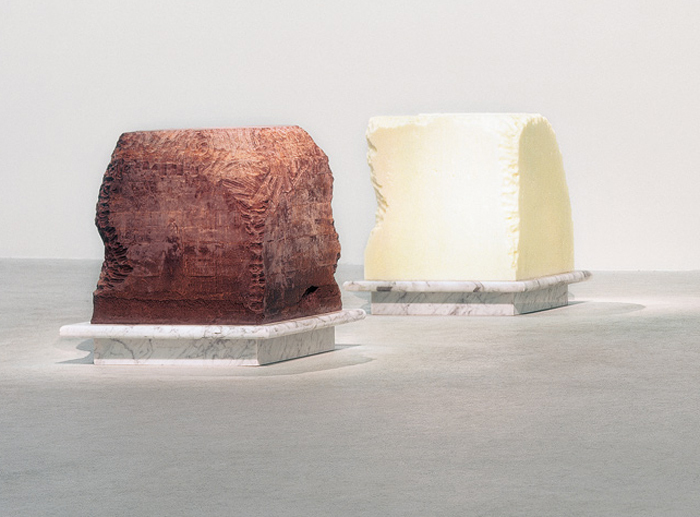 In Gnaw, Janine Antoni gnawed away at a 600lb block of chocolate and another of lard, using the blocks as two parts of a three part installation. The work is a strange one. On the one hand chocolate is delicious, but lard?! Okay, so I’m a vegetarian, a block of lard is never going to be something I enjoy being faced with in a gallery or anywhere else, but I think disgust is a pretty universal response. Having gnawed off chunks of the chocolate and lard, Antoni used them to make the third element of Gnaw. 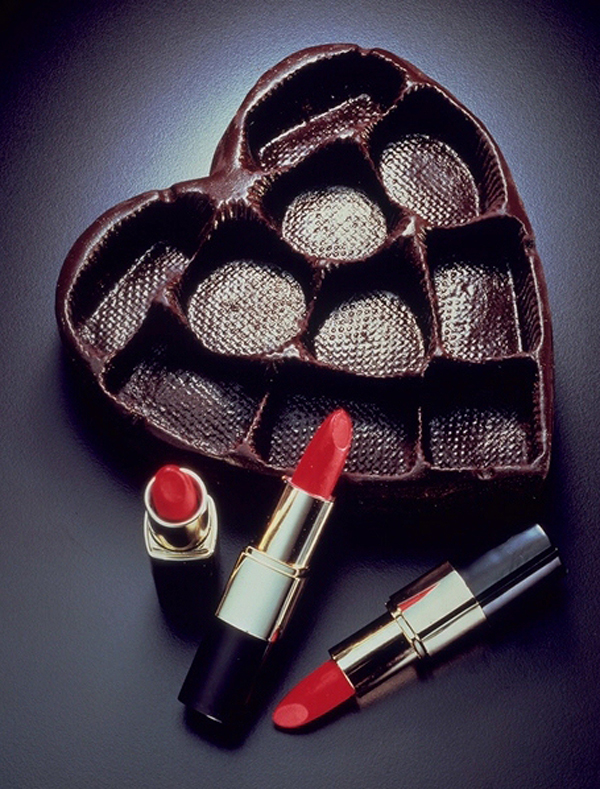 The chocolate was molded into the heart-shaped chocolate-box trays and the lard was mixed with pigment and beeswax to form lipsticks. Thus both substances become seductive in a way but equally both become repulsive: even chocolate loses its appeal when one knows it has been chewed by someone else. It’s a long time since I saw Gnaw in real life – in Young Americans at the Saatchi Gallery in the mid-1990s, I think – but it’s a work that has stayed very firmly in my mind. Admittedly this is partly because it’s partly made of chocolate but Antoni’s working process also fascinates me. Ultimately what I really like about the installation is the way it brings together two materials – one desirable, the other disgusting – and turns them into things that are simultaneously seductive and repulsive. 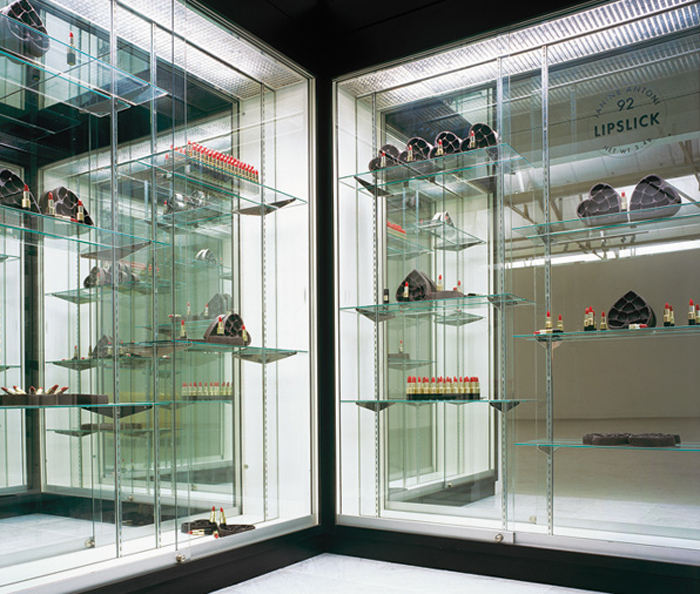 This entry was posted in Installation, Performance, Sculpture and tagged art, chocolate, Gnaw, installation, Janine Antoni, sculpture by Ann Jones. Bookmark the permalink.